What is the Shiny New Item in Your Toolbox? As a system, I think our program evaluation and reporting skills continue to strengthen; thanks, in part, to ongoing organizational support and encouragement (e.g., A&P and faculty promotion workshops, professional conference travel assistance, PD&E staff and workshops, etc.) and resources like SAMMIE. Still, as we discussed last week, we must continue to enhance our level of sophistication in this area. This week’s Update focuses on how and where we communicate our impact. Items 12-14 in the list below focus on our use of social media to extend our reach. The potential for social media in our work presents an incredible growth opportunity for each of us. We may be crafting ideal impact statements for inclusion in the annual report. We may also be adept at summarizing our annual program activities for the two-page handout for use at the annual Legislative Luncheon. But, clearly we have opportunities every day to communicate our program impact with the much larger networked world. Like it or not, the future is a networked world of individuals, each connected with a handheld device to a world of transparency where real time data is being pushed and pulled 24/7. Social media is the shiny new tool in the toolbox that can help us reach and teach to a much broader audience. However, to communicate our work and its impact using social media will require us to re-think the way we assemble the message. While the key components (need, inputs, outputs, outcomes) don’t necessarily change, what must change is the format and manner in which they are shared. From an annual report, quarterly newsletter or monthly update we must re-think our frequency and format. While we are accustomed to providing our written reports to the audiences that have assembled for us; with social media, we must create our own audience. Surely it is possible. In past days, we created a mailing list of subscribers to our monthly hardcopy newsletter. These days, we can grow an audience for our social media content as well. To get started, each of us will need to consider how social media can complement the favorite tools in our ‘teach and reach’ toolbox. No doubt there is much to learn, but we have wonderful help nearby in Kimberly Roush and the Ed Tech Team. Don’t delay. Now is the time to learn and experiment. On February 10 you should have received an e-mail from Cheryl Buck with a personalized survey link to use to indicate whether or not you want to receive a new nametag. Responses are due by February 20. Non-respondents will not receive a nametag purchased by OSUE. For more information on the nametags, click here. A free LGET webinar, "Communicating with Local Government Leaders: 8 Great Opening Lines," will be presented February 19 at noon by Brian Raison, Assistant Professor, Ohio State University Extension. If Extension educators are not talking with local government leaders on a regular basis, they should be. Whether providing an informal “update” on recent activities, teaching a more formal seminar (leadership, land use, economic impact, etc. ), or making a budget request, you have the opportunity to increase credibility by starting with an immediate, meaningful, connecting introduction. This webinar will provide eight approaches that can help you quickly attain the attention of local government leaders and make a more powerful impact. To connect, go to msuextensionconnect.org/LGET and enter as a guest. For complete webinar information, click here. If you are not able to join the live webinar, a recording of the session will be made and posted on the LGET website. For more information about LGET, including webinars, visit: LGET.org. 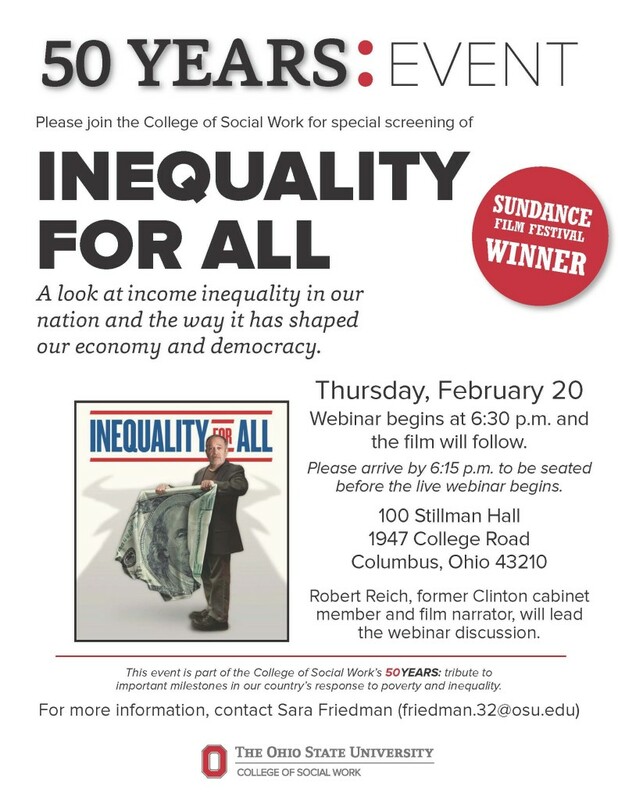 The College of Social Work is hosting the film, “Inequality for All,” on Thursday, February 20, in 100 Stillman Hall (1947 College Road) on the Columbus campus. Robert Reich, former Clinton cabinet member and film narrator, will lead a live webinar discussion at 6:30 p.m. The film, which looks at income inequality in our nation and the way it has shaped our economy and democracy, will follow. Plan to arrive at 6:15 p.m. to be seated for the live webinar. This event is part of the college’s 50 years tribute to important milestones in our country’s response to poverty and inequality. The event is free and open to the public. Read more at: csw.osu.edu/about/news-events. CFAES will present free monthly webinars to help growers and producers enhance marketing and improve and expand sales. The first webinar, "Top 10 Direct Marketing Trends," will be held February 27 from noon to 1 p.m. at:carmenconnect.osu.edu/dmtrends. Contact is Brad Bergefurd (740-289-2071, ext. 136 or bergefurd.1@osu.edu). For complete information and a list of upcoming webinars, visit:directmarketing.osu.edu. Presented by Adam Zwickle, Doctoral Candidate in the OSU Environment and Natural Resources Graduate Program. Presented by Adam Kautza, Doctoral Candidate, OSU School of Environment and Natural Resources. The fifth annual Innovate conference will take place at the Nationwide and Ohio Farm Bureau 4-H Center on Tuesday, March 25, and Wednesday, March 26. Tuesday’s session features the best current uses of learning technology, plus insight into what’s around the corner; the half-day session on Wednesday provides hands-on workshops for trying out many of the new tools and concepts presented at the conference. For complete information and to register, visit: elearning.osu.edu. The Service-Learning Initiative and the offices of Outreach and Engagement and Research are offering small grants to cover expenses related to attending workshops and conferences associated with advancing the scholarship of engagement in teaching and research activities. Applications are due Friday, February 21. For complete information, visit:go.osu.edu/travelgrants14. Professional Development and Women of Color Advancement Grants of up to $1,000 are available for women faculty and staff continuously employed by Ohio State for at least one year and students (graduate/professional students with a 3.0 GPA and undergraduates with a 2.5 GPA). Grants can be used for professional development activities, research, etc. Significant financial need is a key consideration. Applications are due Thursday, March 27, and are available online. For complete information, including application form, visit: criticaldifference.osu.edu. Applications for NACDEP awards are due to Nancy Bowen-Ellzey (bowen-ellzey.1@osu.edu) by noon Friday, February 21. For the application and to view award categories, visit: nacdep.net/awards.php. For complete information and application process, view Nancy's email of January 25. Awards will be announced and presented at the NACDEP Annual Conference in Grand Rapids, MI, June 22-25. When you submit an eRequest for a personal reimbursement and your original receipt has been received online, indicate in the 'Additional Information' box that "original electronic receipt is attached" and upload it in the 'Attachment' section. You do not need to send in a hard copy of an online receipt. University leaders are committed to making Ohio State a great place to work. 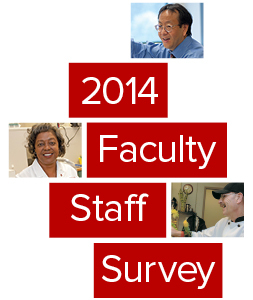 Share what’s great about working for Ohio State and suggestions about how to improve your day-to-day experience by completing the 2014 Faculty and Staff Culture Surveys. Your feedback will help create a healthy, high-performing environment in which students, faculty and staff can work at their best. The surveys launched last Wednesday, February 12, socheck your email for the link to complete the confidential online survey. Read more at: oncampus.osu.edu/a-facultystaff-barometer/.